At 50 years of age, our bodies just don't seem to work as well as they used to. The skin isn't as fresh and dewy, that bum knee keeps us from running like a kid, and our clothes fit tighter than before. The same goes for the mid-century bath. After a half-century of use, parts are old and worn. For growing families and beauty product addicts alike, square footage and storage space are tight. Plumbing fails and the original fixtures break down. While we might not all have the luxury or the inclination to go in for a minor tune-up at the plastic surgeon, your bathroom can --and likely should at some point. Although many homeowners are struck by the shabby looks of older bathrooms, it's the structural elements of the bath that need to be upgraded the most. Remodels of mid-century baths can be simple or glossy, elegant or hip. What they should always be is smartly designed in a way that dovetails well with the original plan. Imagine how wonderful it would feel to enter a space and feel good about what you see reflected in the mirror. Most mid-century modern homeowners want to enlarge an existing bathroom with a bedroom as part of the remodel. These homes tend to have very small bathrooms that incorporate what is (or once was) minimally needed. By today's standards, they are quite tight in the clearances around bathroom fixtures, and there's not a lot of built-in storage space to speak of. Perhaps the best-designed original bathroom in an Eichler home is the one in the X-100, the experimental custom steel house Eichler Homes built in the San Mateo Highlands in the 1950s. 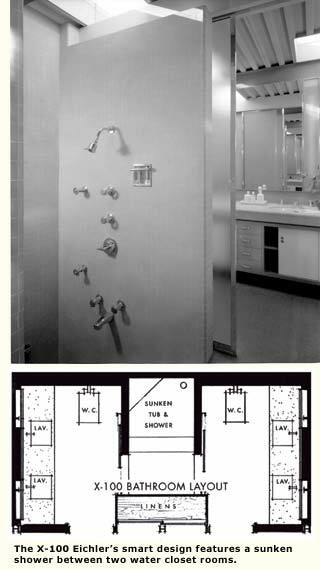 The X-100's bathing area is a sunken shower sandwiched between water closet rooms on either side. The bathing room can only be accessed through sliding-glass doors located in each water closet room. The two water closet rooms each have a toilet and sink, allowing the bathrooms a sense of privacy for the bedrooms nearest them. Positioned in the center of the home and off the main hallway, they also function as public restrooms. Obviously, not all homes have the luxury of the X-100's smart design, so remodeling is oftentimes necessary to bring functionality, beauty, and storage to a bathroom space. 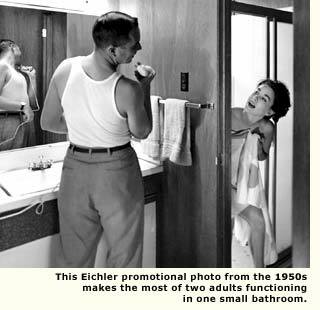 The difficulty in remodeling most mid-century bathrooms lies in the plumbing, particularly for the Eichlers, according to designer Lourdes Garcia of Garcia DeCredico Studio, an Eichler-savvy architectural firm based in the East Bay. "Since Eichlers have hydronic heating running inside their concrete floors, and domestic water lines and electrical conduit under the slab, moving a plumbing wall becomes quite difficult," says Garcia. "This maneuver will most likely encompass tearing up the concrete floor to extend the plumbing to a new location. We try to minimize this impact as much as possible." Sometimes, a complete gut and remodel of the bathroom is necessary to fix the problems in a space. "These houses are typically 45 years old and older, which is just about the infrastructural life of the building," says Ron Key, owner of Keycon, Inc. a general contracting firm specializing in Eichler renewal on the San Francisco peninsula. For a typical bath remodel project, Keycon's crew first tests all of the radiant heat, domestic water, and sewer lines. Then everything in the existing space -- including vanities, wall and floor finishes, and fixtures -- is removed to gain access to the room's shell. Any water, mold, dry rot, or termite damage is cleared away. Removing concrete from the slab floor is necessary to change the in-slab p-trap (the p-shaped section of drain pipe that prevents sewer and wastewater odors from escaping into you home) and to relocate the plumbing. After demolition, the crew begins replacing elements from the ground up. If the p-trap in the shower is above the slab, Key's crew replaces it below the slab. New plumbing and shut-off valves are then installed. "This is especially important because of the age of everything involved here," says Key. As in any mid-century home remodel, electrical is always a concern. Lights, fans, small appliances, and air conditioning require a lot of energy, and the original electrical service often can't keep up with today's appliance demands. Additional amperage will allow the homeowner to run more of today's electronic devices without fear of blowing a circuit.